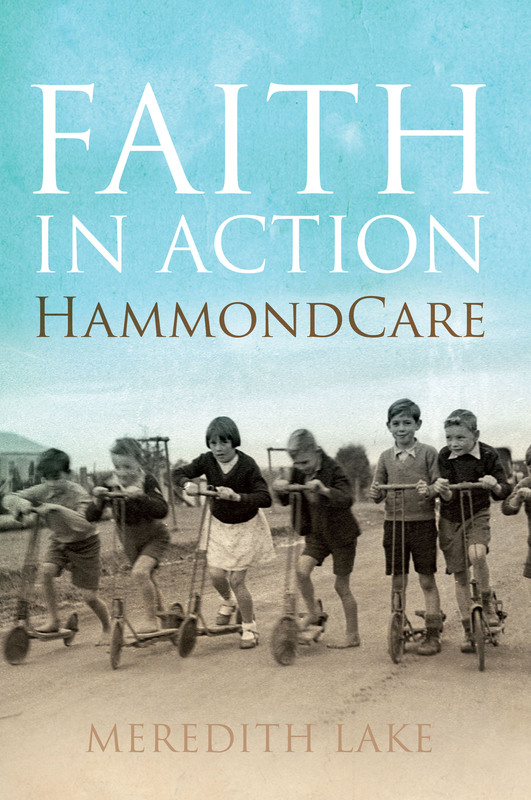 This week we talk to Meredith Lake, author of Faith in Action – the story of Reverend Hammond. Meredith Lake is an historian with a PhD from the University of Sydney, where she has also taught courses in Australian history. Her work on the social and cultural history of religion has appeared in History Australia, the Australian Journal of Politics and History and the Journal of Religious History. This is her first book. Faith in Action tells an inspiring true story. One man had a vision to address the social problems of his day, providing for the poor and unemployed, as well as those afflicted by alcoholism or in trouble with the law, offering them a new start. From his base at St Barnabas’ Church on Broadway, Robert Hammond established one of Sydney’s primary centres of relief for the poor, including an employment bureau, an emergency depot and a soup kitchen serving thousands of meals a year. There are terrific stories in the book brought to life by fascinating historical photographs. MP John Hatton, homebuilder Jim Masterton and the ‘Eternity Man’, Arthur Stace were all helped by Reverend Hammond. Meredith: I’ve always been interested in how people express their beliefs and ideals in the nitty gritty of day to day life, and the effect that can have on communities and even whole societies. And the history of HammondCare is full of great examples of people doing just that – expressing their Christian faith by caring for the poor and needy, with dramatic, sometimes revolutionary consequences. I didn’t know that, of course, when I began researching and writing this book. When HammondCare first asked me to delve into its history, I had barely even heard of it! I certainly didn’t realise that HammondCare is actually one of Australia’s largest charities or that its history included so many inspiring stories. IHM: Q. Which resources did you find most helpful? a. Favourite website? b. Favourite library? Meredith: The Australian Dictionary of Biography is a wonderful resource – well researched, accurate and often entertaining articles about thousands of people who’ve been significant in Australian history, from prime ministers to the guy who invented the hills hoist! I used it to find out about some of the public figures who have been involved with HammondCare over the course of its history – politicians, hospital matrons, clergymen, even a sea captain who’d helped rescue survivors of the Titanic sinking! Meredith: I did most of the research for this book in the HammondCare archives, which are located at Hammondville on the south western outskirts of Sydney. But I always find the State Library of New South Wales really good – they have all the books I want, a wonderful pictorial collection (including a number of photos I used in the book), and then there’s the soaring shelves and flooding natural light in the adjoining Mitchell Library – a lovely place to write or read. IHM: Q. What resources did you come across when researching your book that haven’t been widely used? Meredith: Nearly all my information came from sources that are rarely used – I sat cramped inside a dark and dusty archive every Friday for well over a year! I found lots of great sources in there: old letters, rare pamphlets, and boxes of historic photographs – including some unknown images of that iconic Sydney character ‘Eternity Man’ Arthur Stace. In researching the later sections of the book, I actually had to create some of the resources I needed, by hitting the road and going out to interview people. This was one of the real highlights of the project for me. I met one of Australian country music’s most accomplished yodellers, George Payne, who grew up in the charity’s original settlement at Hammondville; I met some truly visionary leaders who have helped revolutionise the care of our older citizens; and I met ordinary people – mainly nurses – of deep faith and compelling integrity, who really challenged me with their beautiful example of day in, day out love for the needy. It’s been a privilege to share some of these stories publicly for the first time. Meredith: I learned so much researching this book and I was often amazed – or appalled – by the things I was finding out. For example, before researching this book I had no idea how large the problem of homelessness was during the Great Depression. It makes sense that people without jobs can’t pay their rent – but I was shocked to learn of the many thousands who got evicted from their homes during the early 1930s. Whole families literally got turned out onto the street with few possessions and nowhere to go. Many of them ended up in the one of the shanty towns that popped up along the blustery shores of Botany Bay. I was also shocked to learn that there was basically no such thing as aged accommodation until the 1950s. The NSW government only operated three refuges for older people, and they were virtually impossible to get into. Hospitals allegedly refused to admit older people with chronic illnesses. A handful of pioneering charities did what they could, but housing the aged is a very expensive business: without government support, their efforts remained small scale. So if you were old and poor, and you got sick or even just became frail, there wasn’t really anywhere you could go to get care. I read about one old couple – Mr and Mrs Lane – who ended up in a tin shack in the bush. The eighty year old husband was too ill to do much at all, so his seventy year old wife had to chop all the wood and cart all the water. And these were people who had already lived through two world wars and a depression! Meredith: Alongside those terrible tales of homelessness and poverty, I was affected by the extraordinarily bold and generous way people responded to such needs. Canon Hammond, a maverick Anglican clergyman, capped off a lifetime of helping the poor by cashing his own life insurance policy to buy some land on which to build houses for homeless families. He was in his sixties at the time: imagine someone today giving away all their superannuation right on the verge of needing it! But he recognised the urgent need to provide shelter for poor families, and showed a very costly kind of Christian love to set up the Pioneer Homes scheme – one of the most meaningful responses to the Great Depression. In the post-war period, the plight of the aged poor also provoked an extraordinary response. Under new leadership, Hammond’s organisation joined the small but growing number of charities providing homes for the elderly. During the early 1950s, they built a series of cottage houses and then a nursing home to go with it. They did this entirely off their own bat, paying for it with funds donated by ordinary people, raised from the general public. It was an extraordinary effort, and governments didn’t contribute a cent to it! But it was well worth the effort: poor Mr and Mrs Lane finally had a place to live. ‘Few of us ever get dizzy from doing too many good turns’. Meredith: I often wonder what happened to the people who moved to Hammondville as kids, during the dark days of the depression, who grew up there and eventually went on to other things. A handful became famous – such as Jim Masterton, founder of Masterton Homes, and John Hatton, the former independent MP. I was able to interview a few such people as part of my research. But there were hundreds of others – and I wonder how they look back on it all, and what became of them. There’s no way, really, of finding this out – but I also wonder what Hammond would do in the world of today. There are a lot more charities now, and governments play a far more active role in providing welfare and social services more generally. Among other things, this means there’s a lot more regulation and red-tape: you can’t just throw up a few houses and handpick some homeless families to move into them! Needs, too, are different and the role of the churches in Australian society has changed. So Christian charity looks different – it has to – and I wonder how Hammond would tackle the various challenges such organisations now face. Meredith: Writing history is about telling true stories, which makes evidence very important! In my view there’s no substitute for getting back to the primary sources – whether they are old newspaper articles, original letters, or even oral history interviews with living people. Of course, researchers still need to be wary when it comes to using such sources: even original materials can contain errors, and every source reflects a certain politics in terms of what is included, omitted, what perspective is privileged. But dealing with primary sources, and building your story from the ground up, is an essential challenge – and pleasure! – of writing good history. IHM: Q. Are you able to tell us more about the personal stories of those helped by Reverend Hammond such as MP John Hatton, Jim Masterton and the Eternity Man, Arthur Stace? Meredith: The story of ‘Eternity Man’ really says a lot about Hammond and the impact he had on people. Stace was already in his forties when he met the Canon: he’d been an alcoholic for decades and, apart from a short stint in the army, lived a very shady life around inner Sydney. When the depression hit he got desperate – eventually wandering in to Hammond’s Broadway church in search of something to eat. There was a men’s meeting in progress at the time, and Stace sat in. Something must have impressed him, because by the end of the evening Stace had decided to give his life to Jesus: ‘I went in to get a cup of tea and a rock cake but I met the Rock of Ages’, as he later put it. Shortly afterwards Stace was inspired, while visiting another Sydney church, to begin inscribing his own one word sermon all over the city’s pavements: ‘Eternity’. Less well known is the fact that he became a charity worker too. Through the rest of the depression, Stace helped Hammond run a large hostel for unemployed men – where the workless could find a meal, a bed and facilities to shave, mend a shirt or apply bit of boot polish. He also volunteered at the St Barnabas Broadway emergency depot, which passed donated clothes, furniture and other goods on to people who needed them. So Hammond didn’t just give Stace a fresh chance himself: he enabled him to give a fresh chance to others. Meredith: The reader, really, is in the best position to judge! But I think a good history book needs to tell a great story and offer a fresh perspective. Rather than ‘have the last word’ and say something final or definitive, it needs to tell true stories in a way that opens up the issues and stimulates ideas. By showing that things were different in the past, a good history book can give us new eyes for the present. That’s what I’ve tried to do here! You can read more about Faith in Action and buy yourself a copy on UNSW Press.